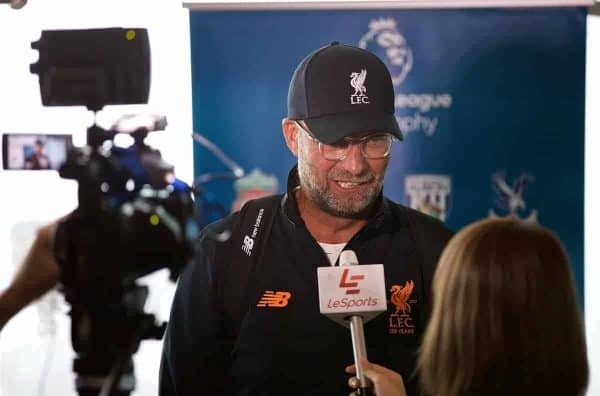 Shortly after landing in Hong Kong on Monday, Liverpool boss Jurgen Klopp sat down for a chat with Rick Olivares for This Is Anfield. Jurgen Klopp’s brand of football has been described as heavy metal. Incessant. Relentless. And intense. Just like the man himself. 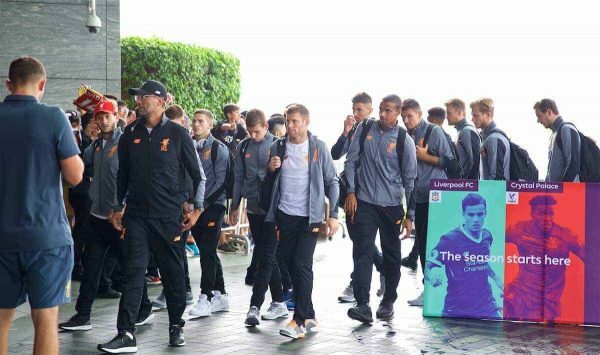 In Hong Kong for a few hours on Monday, the Liverpool manager didn’t betray any signs of jetlag or tiredness. His trademark laugh could be heard even outside the room where he met up with select members of the Southeast Asian press in an event organised by Standard Chartered. He smiled that toothy grin of his. If that put a damper on local media looking for a good quote or cheer, Klopp quickly made up for it. “It doesn’t mean though that not being here doesn’t mean I know about it. It’s an interesting and historical place to be in. I know the history of the place and its role in the world. Then the boss settled down for business. 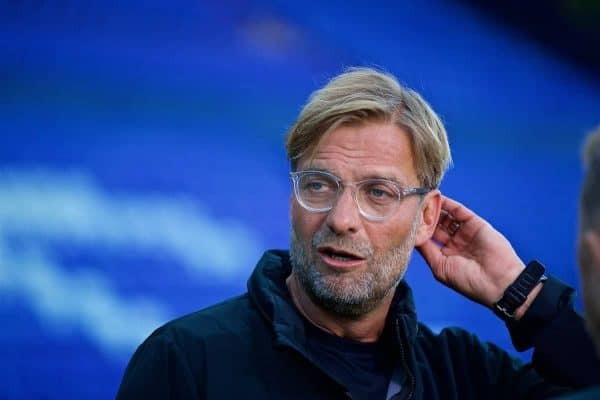 Incredibly, he is far easier to understand than previous managers Kenny Dalglish and Brendan Rodgers. These pre-season matches far from England; does he think they will help his side come Premier League (and Champions League time)? The sojourn into the Far East is oft looked at derisively by some as a money-making scheme; one to please the sponsors. Maybe. Maybe not. The trip is also used for the team to bond away from the comforts of home. “I hope so,” he laughs. “In the pre-season, you do things to make it more difficult than the season. During the season, you play against good teams in difficult circumstances. So hopefully, it helps. “The camp is very intensive a day before, two days before. We train really hard. When you feel fantastic. But it isn’t likely you will be fantastic 365 days a year. So we try to learn from it. To bring out best performance on the pitch. The German has obviously revitalised Liverpool Football Club, its massive fan base, and even put rivals on notice. The man has been an agent of change. I am curious though… is Liverpool – the club and the city changing him. “Liverpool is a wonderful city. It much nicer than you imagine. If you hear about Liverpool, you think about the music and football. And of course, it is very famous for its music. But if you go there, there is more to the music and football. Is there a time table to winning the title? “Hopefully, soon. It’s not that I say this year is too early, or next year is too early. It is what we do during the season. We know the quality of the other teams. “If we can improve the kind of play last year – and what was already good in a lot of things — then we can have more points. If we have more points, then it is more likely. It is the same approach when it comes to a spot on his first eleven. “I am performance based; that’s all.” Pragmatic the man is. Yet as quotable as he is, Klopp surprisingly doesn’t have any social media platform. 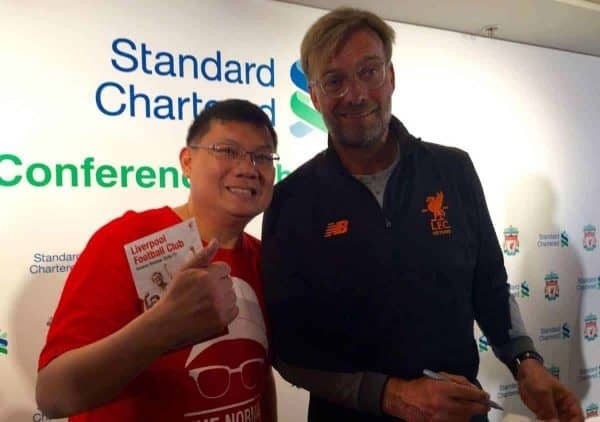 Rick Olivares with Klopp in Hong Kong on Monday. As usual, Jurgen Klopp does his talking on the pitch.